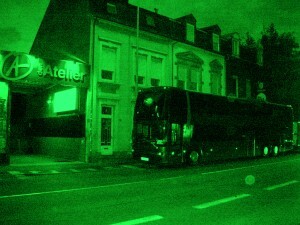 I’m walking towards the Atelier in Luxembourg. It is Monday August 17th. Primal Scream are in town and about to play a gig here. It is apparently their first visit to the country. Their latest studio album is entitled Beautiful Future ; their 9th album on the trot. 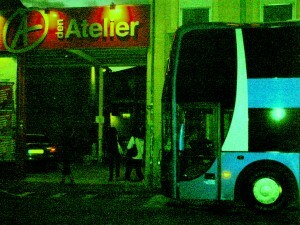 An eighty foot bus with only the luminosity of plasma screens visible through the blacked-out windows is parked adjacently outside the venue. Two gents are seated at the front of the bus : one wearing an army green Che Guevara cap with a red star on the front ; the second is more in the mould of a classic groupie who has been just about everywhere and seen more or less all. He dons a big grey beard which is probably trimmed decadely. I opt to knock on the window on the side of the Che endorser. I think he’s the bus driver. I’m somewhat relieved that as the door slides open, the bearded guy leaves me his seat and slopes down somewhere along the corridor. The interior of the bus is amber lit. He pulls out from under his seat what looks like a DJ LP Case. He opens the lid and starts flicking through a box-load of vinyls. He takes one out then presses a red button on the dashboard beside the steering wheel. A square lid on the dashboard then opens up to reveal a turntable / stylus. He takes a specific record out the sleeve, places it on the turntable and drops the stylus carefully down on some pre-chosen grooves. a piano kicks in, followed by a falsetto electronicalised hooter. It is Roxy Music Virginia Plain. It is loud. The bus almost shakes. I get the message. That practically answers my question. Bus Driver « Sometimes Bobby will walk up to me during the journey and tell me to put that song on as soon we reach the city of our destination. It helps him get prepared ; psyches him up a little. He takes the Roxy Music record out and puts it back in the sleeve, then drops another vinyl on the turntable. White light, Aww white light I said now goodness knows, do it. It’s Lou Reed, Mo Tucker, Sterling Morrison and some Welsh nut called John Cale. John Cale grew up in a Welsh valley under the gun of religion and language, was the son of a coal miner and couldn’t speak English until he was seven years old. He grew up playing the piano and viola and thanks to those musical skills he had acquired at a young age got the opportunity to study experimental music at London University before deciding to pack his bags and viola case for a scholarship across the Atlantic with the Boston University Orchestra. At the age of 23 in New York he founded what would go down in musical history as the Velvet Underground . « Here’s another good example » he says replacing another LP. This time it is the Rolling Stones ; Behind the Buttons. Just prior to its release in the spring of 1967 Mick Jagger and Keith Richards – following a tip-off – got caught up in the Redlands drug bust, got arrested on Drugs charges and alleged offences against the Dangerous Drugs Act. One week after news of the bust was reported the Rolling Stones embarked on a European Tour. As the song fades I begin to hear a reverbed bass being ushered from the amps of the Atelier. It sounds like Country Girl. The time has come for Bobby Gillespie et al to take to the stage. Do it.  Archived in Random Music Articles, Music and tagged Interview, Luxembourg, Primal Scream, Scotland, Scottish, video. Bookmark the permalink. Is this 4 real? They have a record player on the bus? That was me with the state of Texas flag in that video. Never seen this before. Amazing!